View Magento 1 version here. 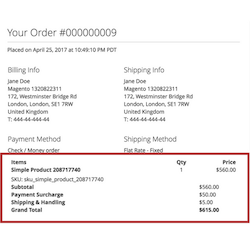 Charge a small order fee to customers (fixed fee, percentage amount or combination) if their order subtotal is below a minimum amount or enforce a minimum order amount. This allows you to recover your costs in an easy and transparent way, without increasing your product pricing. Easily add, manage and delete surcharges in minutes. Do it all from the Magento backend without technical knowledge. Need to add surcharges based on payment method? Check out the Fooman Payment Surcharge extension. Existing Magento 1 Fooman Surcharge customers receive an exclusive discount on upgrading to this Magento 2 extension. Email us at support@fooman.co.nz and we'll hook you up! Will Fooman Small Order Fee work with my one step checkout? The ones that don't work out of the box are most often the ones that look at the individual cart items instead of charging the grand total of the order while neglecting custom totals (due to the way the one step checkout extension is coded which is beyond the control of Fooman). Rest assured that our extensions include a 30 day money back guarantee, so feel free to test out the extension on your own development site with other extensions. Can I set up more than one small order fee? Yes you can - but remember that multiple small order fees will cumulate. For example, a $5 small order fee of orders below $10 and another $2 small order fee for orders below $20 will give a total surcharge of $7. How do I make sure I'm using surcharges the right way? There is no one right way to use surcharges. Every store is different, and you know your customers best. Here are some of our tips on how to use Surcharges without turning your customers off.